Although still not widely recognized in the US, Safer Internet Day is nevertheless “official” now, with participation from the Department of Homeland Security (DHS) and Department of Education (DOE). Though marked by Net users in schools, nonprofit organizations and governments in a growing number of countries since 2004, it was recognized by the US government last November, when Secretary of Homeland Security Janet Napolitano joined European Commission Vice President Neelie Kroes in signing a Joint Declaration in London, “committing to make the Internet a safer and better place for children,” according to the EC’s press release (here’s DHS’s release). And on February 5, the DOE is joining a multistakeholder, private- and public-sector event at the National Press Club in Washington to mark the day, whose theme is “online rights and responsibilities” and main message “Connect with Respect.” Other participants include Google, the Family Online Safety Institute (FOSI), the National PTA, the National Cyber Security Alliance and Project GOAL (Getting Older Americans onLine). It’s not yet clear how the US government’s participation will unfold – probably in a supporting role like the DOE’s at the National Press Club event – but a number of non-profit organizations and technology companies are recognizing the day with their own programs throughout the US and across the Web. For example, Trend Micro is launching its 2013 “What’s Your Story” contest, aimed at encouraging youth to be the educators in safe, responsible Internet use; Google is relaunching its safety and privacy resource site Good Good to Know; and Microsoft is holding a “Safer Online Teen Challenge” and a live “Connect with Respect” Twitter party at 11 a.m. (Pacific) on February 5. In the non-profit sector, FOSI’s Platform for Good has launched its “Pledge for Good” and, beginning on Tuesday, you’ll be able to take the pledge on the Platform’s Web site and Facebook page. By next year the list will be too long for a single post. 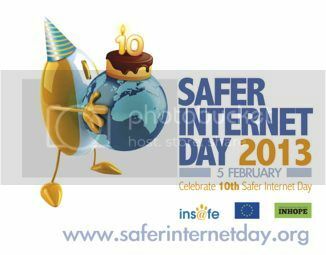 In 1999, the European Commission (EC) created the Safer Internet Programme, which led to the creation of Insafe, a European network of Internet safety awareness centers to promote safe, responsible use of the Internet for young people. In 2004, the program created an annual event called Safer Internet Day, which happens every year on the second day of the second week of the second month. This year (2013), that’s Tuesday, February 5. Although activities are coordinated among European countries, the day’s events take place in individual countries worldwide in a wide variety of forms, from awareness campaigns in schools to online events to speeches at Internet safety conferences. Participation has grown to where the day is marked in some 90 countries now. In Europe, as in many countries, it’s not just Internet safety groups that participate. In the UK, for example, the BBC is broadcasting special programming on Tuesday, while the British Post Office will be displaying Internet safety videos on screens normally used to advertise postal products. We’ll probably soon see rapid growth of Safer Internet Day celebration in Africa’s developing countries, where Internet connections are largely on the mobile platform and cellphone adoption is exploding (see “Celebrate Digital Africa!” on FOSI’s GRID).